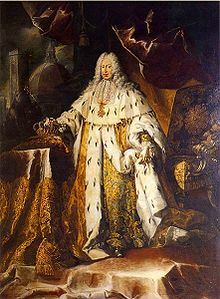 Gian Gastone de' Medici (Giovanni Battista Gastone; 24 May 1671 – 9 July 1737) was the seventh and last Medicean Grand Duke of Tuscany. 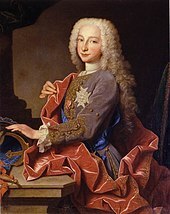 He was the second son of Grand Duke Cosimo III and Marguerite Louise d'Orléans. 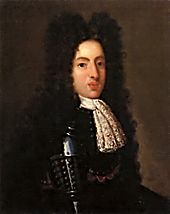 His sister, Electress Palatine Anna Maria Luisa, arranged his marriage to the wealthy and widowed Anna Maria Franziska of Saxe-Lauenburg in 1697. The couple despised each other and had no children. 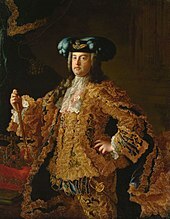 As Grand Prince Ferdinando, Gian Gastone's elder brother, predeceased Cosimo III, Gian Gastone succeeded his father in 1723. By 1697, Violante Beatrice and Ferdinando had been married for eight years and still lacked issue, as did Gian Gastone's sister, the Electress Palatine. Concerned for the future of the dynasty, Cosimo urged the Electress to find Gian Gastone—currently the only one of his siblings unmarried—a suitable bride. She put forward Anna Maria Franziska, her brother-in-law's widow and potential heiress of the Duchy of Saxe-Lauenburg. The bride-to-be was hailed as "more like a Bohemian peasant than a princess" by a contemporary. They were married in Düsseldorf, the capital of the Electorate of the Palatinate, by the Bishop of Osnabrück on 2 July 1697. 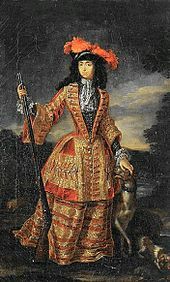 As she did not like cities or courts, Anna Maria Franziska demanded they establish themselves in her Bohemian residences, Ploskovice Castle and Reichstadt (Zákupy), post-haste. Gian Gastone gave his all in reforming his realm, purging corrupt Churchmen from government, reversing Cosimo III's ban of teaching "new ideas", i.e. the philosophy of Galileo et al., in the University of Pisa and abolishing the burdensome income taxes. As a result, he was sincerely mourned by his people. Charles de Brosses, a French politician and writer, wrote, in 1739, "The Tuscans would give two-thirds of their property to have the Medici back, and the other third to get rid of the Lorrainers." This sentiment did not diminish much in 62 years, when, in 1799, during the French occupation of Tuscany, the people called for the long-dead Gian Gastone to ascend the throne. His remains were interred in the Medicean necropolis, the Basilica of San Lorenzo. His corpse was dressed in "black velvet", according to Official Report on the Examination of the Tombs in the Medici Mausoleum of 1857, "with, over this, the great cloak of Grand Master of the Order of Saint Stephen. On the head was the Grand Ducal crown, worn over a cap; and by his side the sceptre. But the crown and sceptre were corroded by the acids which had been used in embalming the body." The one group who may have taken exception to such adulation is the Freemasons whom, in his final year, under harsh penalty he forbade to meet. As of August 2015, access to see his white rectangular marble tomb slab is denied. His remains are not under the white slab, they are under a grey circular stone near his slab. Under this grey stone is a red brick staircase which leads to an underground burial chamber that was studied for the first time ever in 2004. In the chamber are many family members. Gian Gastone had a lead coffin in a wooden frame. It was replaced with a modern coffin. Near him are the remains of many De Medici children who were buried in unmarked graves. Some of them still have their garments. ^ Galleria Palatina (2006). "Anna Maria Luisa de' Medici - Biografia" (in Italian). www.polomuseale.firenze.it. Archived from the original on 17 July 2011. Retrieved 16 November 2009. Garrido, Fernando; Cayley, Charles Bagot (1876). A history of political and religious persecutions, Reprint: Arkose Press (September 26, 2015), ISBN 978-1343568808. Row, Augustus (1868). Masonic Biography and Dictionary J.B. Lippincott & Company, Reprint: Kessinger Publishing, LLC; First edition (September 10, 2010) ISBN 978-1165041398. Wikimedia Commons has media related to Gian Gastone de' Medici, Grand Duke of Tuscany. This page was last edited on 14 April 2019, at 00:04 (UTC).